I’ve found a snake in my yard, how should I deal with it? While spotting a snake close to your home is often very concerning, the truth is that often your best option is to not interact with it at all. But this may seem counterintuitive, after all, aren’t snakes dangerous? Georgia is home to a diverse variety of snake species, with over 46 identified species calling the state home. 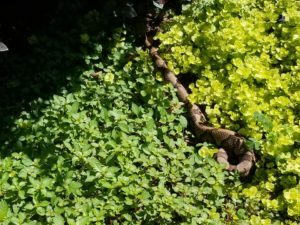 The warm, humid weather of Georgia allows snakes to feel right at home, and our rich biodiversity provides them with plenty of prey to subsist upon. Though snakes live throughout the state, it is rare for humans to encounter them due to their reclusive nature. Snakes are not aggressive creatures and would prefer to avoid any encounter with humans if possible. For this reason, most snakes that you may encounter near to your home are often just passing through and will cause you no harm. Snakes are not just a neutral party either, they actually serve an important role in pest control. Snake species of all kinds are predatory, and they often help to control the populations of rats, mice, and other destructive wildlife species. But what about venomous snake species? Among all of the snake species active in Georgia, only 6 are venomous. It is fairly rare to encounter any snake, much less a venomous one. While snakes can and will bite if threatened, they will only do so if left with no other choice. The truth is, snakes (including venomous species) are only a threat to you when disturbed, and otherwise they have no interest in acting aggressively towards humans. Most instances where humans suffer snakebites occur when a person encounters a snake unexpectedly. This can occur while hiking, or when the snake is hiding in a secluded area with limited visibility. To help protect yourself from snakebites, it is critical to be cautious when reaching into areas without good visibility. Hikers and campers should also be careful to watch for snakes, particularly in areas with heavy underbrush. If you are bitten by a snake, it is imperative to get medical attention as soon as possible, especially if you believe the snake to be venomous. But while snakes are typically a benefit to their ecosystem, they can become an issue if they are in close proximity to your home. Outdoors, snakes are sometimes found in gardens, wood piles, or other debris. Snakes can further become a nuisance if they move into a structure. Like many other wildlife pests, they may seek shelter in barns, sheds, or crawlspaces due to substantial rainfall, extreme temperatures, or other environmental factors. In such cases, they can be a nuisance or even a risk due to the increased probability of an encounter with a person or pet who stumbles upon them by accident. If you encounter a snake around your home or yard, your best option is to call in a licensed pest control professional to remove it. The fact is, even non-venomous snakes can bite, and they can be difficult to handle without proper equipment and training. 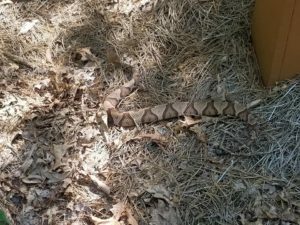 Further, it is often preferable to not kill the snakes, as they often can be relocated safely and therefore continue to provide benefits to the ecosystem. While a snake in your home is an unlikely threat, the fact remains that it is good to have someone to call for even the most unexpected pest problems. At Canton Termite and Pest Control, our decades of experience in the pest control industry have given us the expertise that we need to tackle any pest problem that you may encounter. We are the industry leader in safe, reliable, and comprehensive pest and wildlife control services AND our 100% Satisfaction Guarantee ensures that you can have a stress free solution to your pest problems. So don’t let pest problems get out of hand, call us TODAY at 770-479-1598! Here’s to YOU living PEST FREE!